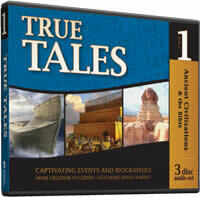 Disc 1: Noah’s Ark - Join Diana on an adventure as she takes an in-depth look at Noah's Ark. What happened? How did they live on the Ark? Where is the Ark? How was the Ark built? Includes an interview with Ark expert Tim Lovett. Disc 2: Seven Wonders of the Ancient World – Diana takes you on a whirlwind tour of the Seven Wonders of the Ancient World and some of the incredible engineering that went into them. 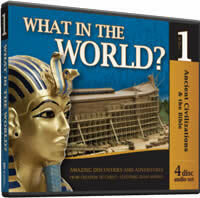 Also discover some tingling facts such as: how the curtain from the Temple in Jerusalem may have ended up in Olympia; how Alexander the Great offered to pay for the completion of the temple of Artemis; how the body of Mark the Evangelist was stolen out of the city of Alexandria; and much more! Disc 3: The First Christmas - In Diana’s popular story telling style, you will examine the circumstances surrounding the miracle of the first Christmas from historic documents of Josephus, ancient rabbinic writings, modern archaeological discoveries, and more. Discover the amazing time period in which Jesus was born: the Pax Romana, the Hellenistic flavor of the ancient world, the history of the Jews up to that point, and the specific dating by the Gospel of Luke (with the controversy surrounding it). Meet the fascinating (and sometimes horrific) people of the Nativity, such as Herod the Great (of whom Caesar Augustus said, “I would rather be Herod’s pig than his son!”), the shepherds of Bethlehem, the priests serving at the temple, and the people of Galilee. Learn the incredible details of the altar of incense (where Gabriel met Zechariah), the reasons the Pharisees didn’t recognize Jesus when He came, the place of the Magi, and even the rabbinic belief that the Messiah would appear to shepherds in Bethlehem! From the “History Revealed” curriculum. 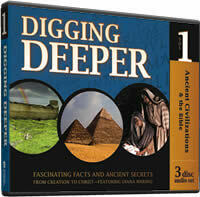 View the entire Ancient Civilizations and the Bible collection.